The cold, lament floor offers no sympathy to Jenna's bare feet as sharp, unforgiving shivers are sent throughout her spine. She hurries across the kitchen in search of her only salvation, the small round area rug in front of the fridge, placed conveniently for sanctuary when battling the midnight snack. Though, not practical in this situation, Jenna wishes she had remembered to use the birthday gift she received just days before, a pair of Firstgear Heated Socks. The heated socks would have made this trip, and so many before it, an easy venture to satisfy the late night cravings, possibly keeping her in a sleep-like nirvana instead of rudely awaking herself with each freezing step. The moral of this story is: don't underestimate the comfort of having toasty toes. When riding in the colder weather, feet sticking out exposed to the rapid gusts of wind caused by speeding through the city, the only wish some of us have is that our feet don't fall off. 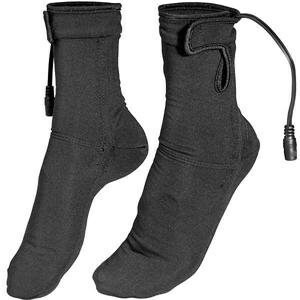 The Firstgear Heated Socks are completely practical for when you're riding, and they plug right into their heating system and are designed to provide heat on the tops of the toes. The fabric is comfortable, soft, thin, and wicks moisture away from the skin. The heel is fitted, and the toes are seamless.